Tilt can be used as an input modality for mobile devices, providing possibility for touch-free text entry implementations. This paper builds on previous research on modeling three text entry methods that utilize discrete tilt concept and rely on tilt-only interaction. These methods are analyzed a priori in theory, however, they have not yet been comparatively assessed by empirical approach. 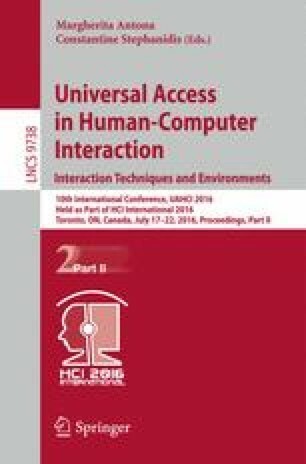 The work presented herein offers a contribution in that respect, as methods are evaluated against efficiency, learnability, and users’ satisfaction in a study involving 20 participants. The efficiency of tilt-based text entry is inspected by observing performance metrics through repetition and practice time. Required physical and mental demands are also investigated, as well as are perceived frustration and overall effort. The results obtained from controlled text-entry experiment supported a detailed comparative analysis of methods’ characteristics, and revealed a relation between theoretical predictions of upper-bound text entry speeds and real efficiency of the presented methods.